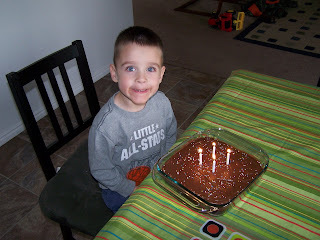 Today for my son's birthday, I wanted to make him a little cake so that he could blow out some candles, but I didn't want to do another big cake like I did for his birthday party on Saturday, so I looked online for an easy cake recipe that I could half easily, and I found a gem! It was about as easy as using a cake mix and tasted so good! The frosting recipe was tasty too!